Do you have an old Worcester boiler? Running an old, inefficient boiler means that up to 30% of the hot water and heating fuel requirement could be wasted. That’s why we are running a cashback promotion to encourage Worcester customers to upgrade their boilers and save as much as £350 on their annual heating and hot water bill. The ‘Upgrade your Boiler’ promotion runs until July 2018 and is being offered by our service engineers to customers whose existing boilers are over 15 years old. 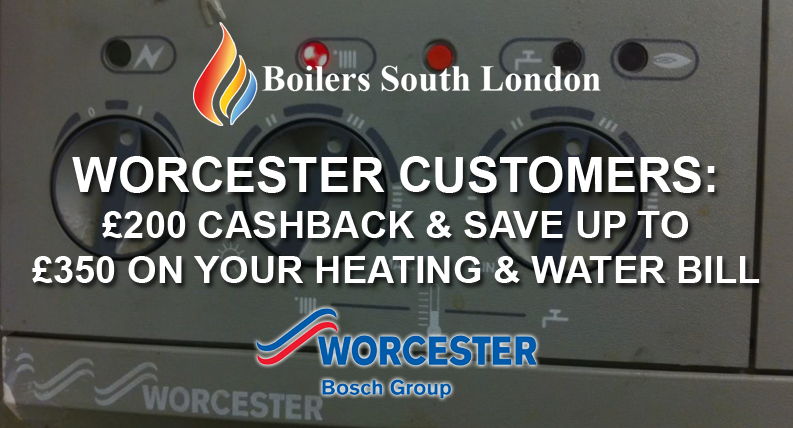 the special deal enables homeowners to claim up to £200 cashback when upgrading from their current Worcester boiler, to a Greenstar. £150 cashback for any Greenstar boiler. An additional £30 cashback for adding a Greenstar System Filter. A further £20 for also choosing an intelligent control. As a Worcester customer, if you are eligible you should of received a upgrade code and leaflet, please contact us if you would like to take advantage of this special promotion. We will carry out works for you and will register the installation within 30 days of installation so you can make your claim. You can also find us through the FAI tool on the Worchester website as an approved local installer.